A PDC for 9 Committed Youths and Parents with PermaMed! Thank you for your support! We pledge to help make the world a better place using permaculture! We will list your name or organization on the PermaMed Facebook page and website. A complementary hug when you visit our permaculture sites. All of the above plus your name or organization listed in the credits in a special thank you video you can post on Facebook or your blog. All of the above plus a hilarious limited edition bloopers reel of all our mistakes while trying to make this crowdfunding video for We The Trees. All of the above and an invitation to tour one of our PermaMed demonstration sites. Plus a 2016 PermaMed calendar pdf download with a personalized “Thank You! ' with your name or organization. All of the above plus a tree planted in your or a friend's name at one of the PermaMed demonstration sites with a personalized digital “Thank You!” card of the food forest site where it is planted. That’s a tree and five dollars to sponsor each of us! Thanks! All of the above plus a 75% off coupon to use on select PermaMed workshops. Limited to 20. That’s 10 dollars to each of us-thank you! All of the above plus: three trees planted in your name (or in a friends) at our permaculture demonstration site—great holiday or birthday gift! A special digitized thank you card with a photo and a description of the food forest site you can share or gift. All of the above plus a personalized digital permaculture resource package: loaded with permaculture information, references, powerpoints, and resources from our PDC teachers. Plus an Invitation to the closure party of the PDC. That’s sponsoring each of us for 20 dollars! Thank you!!! All of the above plus a 2 hour Skype consultation - brainstorm time and ideas for designing your personal project/site with our PermaMed team and Pathway members. That’s $ 30 sponsorship for each of us! Thank you!!! All of the above plus design consultation of your project or permaculture site plus 6 hours of labor to get it off to a good start to implement it. (Limited to Mallorca). That’s a sponsorship of 50 dollars to each of us and that would get us well on our way to reaching our goal!! Terrific!!! Thank you! That’s a 150 dollars sponsorship to each of us and attendance for you or you can send a friend to join us on the PDC! Plus all of the above. Come join us! Thank you so much for helping us reaching our goal and investing in a better future! You are amazing! 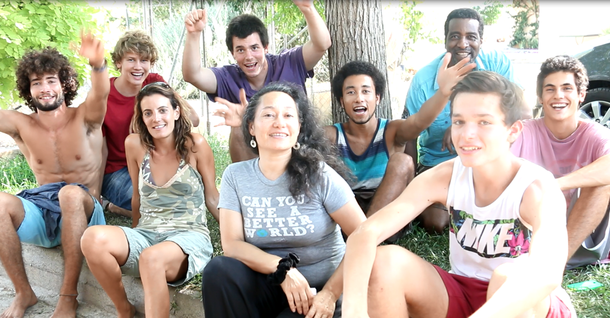 Help support 9 committed youths and parents to take a Permaculture Design Certification (PDC). We promise to use our PDC experience to help make the world a better place! Through your support we hope to join respected permaculture teachers Robina McCurdy, Alfred Decker, Julio Cantos, Miquel Ramis, and the Permacultura Mediterránea (PermaMed) team for a life-changing Permaculture Design Course (PDC) on Mallorca. The PDC is a 90+-hour certified holistic course encompassing a wide range of topics that demonstrate how to live and work more consciously within our ecological, economic and social environment. Hosted on permaculture demonstration sites in Mallorca, Spain, the PDC will be composed of lectures, discussions, practical activities, and design exercises at the sites thereby supporting their develop too. We will gain knowledge and skills to enable us to design and implement the principles of permaculture and the creation of truly sustainable systems that can enable us to live well and with respect for each other and the earth. We know that through the application of holistic land management, water harvesting, soil regeneration, forest gardening and by creating ethical economic and social systems with permaculture values we can turn things around and help meet the challenges that are facing our world today. We are a group of people—primarily youths, but including some parents too—who are already working hard to attend a PDC through a work exchange program. Some of us hope to take a PDC in English (October 27- November 10), while others are working toward the attending a PDC in Spanish (called a 'CDP', which will be on weekends November 2015-March 2016). Both PDCs are offered through PermaMed and will enable us to bring more knowledge and skills to support a more sustainable future for our communities. We are ready for this challenge, but we need your help! Your contributions help us to cover the costs of taking a PDC. We have been able to raise the course fees through the PermaMed PDC exchange program, thanks to the generosity of the teachers and the PermaMed board. Under this exchange program each participant is working 100 hours at PermaMed demonstration sites and projects to earn a place in a PDC course. Your contributions will cover the fixed costs of food, lodging, and course materials. During the PDC exchange program we have already learned natural building techniques in the construction of a small shed, a solar shower, a compost toilet, clay and lime plasters, and have designed gardens and created compost at the demonstration sites. This has awakened and inspired us to want to learn more and this world standard PDC course will do just that. Who are we: An introduction to an inspired team! So here we are, as mixed a bunch of people as you can imagine, of different ages and backgrounds, with a common love and interest in permaculture and farming, hoping to spark the future of permaculture on a beautiful island in the middle of the Mediterranean!!! Some of us have known each other since we were small children and have been working on gardening projects in Finca Son Barrina for over 10 years. We see the island of Mallorca as a perfect starting place in many ways. Although it offers a year round growing season, it is challenged by climate change, water shortages, eroded landscapes, unsustainable agricultural and tourism practices. It's bad. But it's not too late. Not only do we want to make our island more sustainable, we want to seed the world with permaculture. Over 13 million people visit Mallorca every year and that’s a perfect opportunity to reach a lot of people. Meet our team, the teachers, and Permacultura Mediterránea (PermaMed) team. There are more details about PermaMed and the PDC below. My name is Dani Mildner Wilson, I am 16 years old and I live and grew up on an organic farm where we do a lot of projects, both PermaMed organized and not. I went to several schools around the Island, but now my parents support me in looking for a more holistic and eco-friendly education that can lead to a better and healthier future. Aside from permaculture I spend a great deal of time playing football and attending football training, as it is pretty much my main hobby. I’ve attended for a year now a weekly class on bio-construction with Miquel Ramis, and work in my own Finca for my mother or recently Alfred Decker. I’m hoping to take this PDC to help contribute to my A-levels as I’m preparing myself to take them outside of the regular school system. My name is Victor, I´ve always lived in Mallorca. Since I was very young I have not felt inspired by how our current system is working. I attended traditional schools but did not find many subjects presented in a interesting or meaningful way, so they did not motivate me in a way I felt was truly fulfilling. But then I found out about permaculture and its philosophy. Permaculture opens a whole new approach to life. Now I´m surfing this new sea that truly inspires me. I have actively been working over the last few years, learning new skills and new ways to design and implement them. I am apprenticing with Miquel Ramis at Artfex, a sustainable local bioconstruction project and working with PermaMed and Escola Kumar. I have taken a PDC and would like to deepen my knowledge by taking another and to start a diploma in Permaculture. Eddie Brown, Meiling Colorado and their son Eddie see this as a threefold family project, and are looking forward to bringing home a lot of knowledge and experience. This family's journey in Permaculture started when Meiling and Eddie, driven by worries about the heritage we are leaving behind, were lucky enough to be invited to join an ecological community food garden. The three of them learn and implement all they possibly can in PermaMed's community projects, and in their small urban garden in the city of Palma. Doing this PDC as a family unit will add immense value to their Permaculture understanding and experience. Meiling's aim is probably the same as any mother's would be, to facilitate a better world for future generations. With this in mind she has participated in projects ranging from planting and growing food to bioconstruction. She considers that Permaculture, with its holistic outlook, holds the key to solving many of the issues troubling us today and, and according to her family, is the driving force behind this family project. Eddie Brown has also taken part in the community gardens and bioconstruction but nowadays his main focus is soil regeneration with the use of soil amendments such as biochar, compost, compost tea and worm compost. Through Mallorca's Biochar he offers a soil regeneration service to the island's farms and gardens. Their son Eddie is eighteen, and has been in search of a viable alternative in education, as so many youths on the island. After graduating at sixteen he took a course on bioconstruction ar Artifex Balear with Miquel Ramis, and then went on to help his father with Mallorca's Biochar. He is also taking part in PermaMed's Food Circles Project and the demonstration site at Escola Kumar. My name is Peter Mildner Wilson. I am 20 years old and have grown up on my parent’s organic farm that has facilitated and helped promote several permaculture courses. I have done most of my education long distance from Canada. I enjoy swimming, reading, nature walks, writing poetry and playing video games. It is my long term goal to become a Waldorf primary school teacher and as such, I feel it is really important that I now complete a PDC. Permaculture and sustainability are important for our planet’s future and I feel that it is important to pass on these traits to future generations. During my 8-year first stage of professional life in Barcelona, working as a Business Intelligence Analyst in a pharmaceutical company I was awakening and so changing my mind regarding social and ecological ethics. I decided to quit the job and try to live in a more natural way with more common sense, lowering my carbon foot print as much as I can. I decided to move to Mallorca to have everything close by and live in a new life style. I studied nutrition and also completed a post graduate from GAIA Education: Design for Sustainability. At the same time I have been doing several courses in regenerative agriculture, biodynamic agriculture, ecological agriculture and Permaculture. I really want to live in a more self-sufficient and ecological way. The PDC will give me even more tools to walk the path towards this goal. My name is Elias and I'm 14 years old. I've been doing Permaculture for most of my life so far and hope to continue to do so for as long as possible. My first experience of Permaculture was when my parents did a PDC with Darren Doherty, I didn't really participate fully in this PDC because I was 8 at the time but I still did do some of the work and listened to some of the talks and other activities. My next encounter with Permaculture was when I was 10 years old and it was at the Gaia EDE at Son Rullan which I completed after doing all 4 modules and became the youngest Certified EDE Graduate at the time. I then continued on to do my first full PDC when I was 11 which I did with my cousin and received my first PDC Certificate. I currently live at and help maintain a Permaculture demonstration site for Escola Kumar and PermaMed. I would like to take another PDC in October with Robina in order to get one step closer to achieving my goal of getting a PDC Diploma one day. A couple years ago I did a Education and Permaculture Workshop and really enjoyed working with Rosemary Morrow during the workshop. I have also been doing projects throughout the last 5 or so years including working in my own garden and doing projects such as building multiple compost piles, gardens, and building a Super Adobe house. I have also participated in a course over the last two years with Miguel Ramis who has been teaching me bio-construction and other techniques. I have been working for the PDC exchange with Alfred and the PermaMed team so that I can further my learning experience when I hopefully attend the PDC in October. I am Samuele, I'm 17 and Italian from Verona. I enjoyed studying art and sculpture, but felt drawn to nature and to develop a better understanding about what I want in my life. So I left school at 16 and started working by creating fresco's and wall paintings for clients and in public places upon request. I left school because I felt I wasn't allowed to freely express myself and was disillusioned by the rigid hierarchy. I felt it was a massacre of true education, disempowering and controlling, which filled me with fear and rage. I found Permaculture while searching the internet. I was interested in an approach to living closely and with respect to nature. While in Emilia Romagna I was able to take a three day introduction course to Permaculture and a month after that I took my first 72 hour PDC held in Piedmont, in the province of Cuneo, instructed by Pietro Zucchetti. I decided to go to Mallorca and continue my training. I was welcomed into PermaMed, were I found a team of people from different parts of the world, who were supportive and available to share information. So I decided to take another PDC and joined the exchange program to help cover the course fees. Now I learn every day what I like, feel and work the land with my hands, listening, and sowing plants ... I like to watch them grow from seed to fruit, and die, as part of living energy. My goal now is to get the second PDC, learn and share my knowledge with other people who need help, and work my way towards the diploma in permaculture, keeping my life open to possibilities along the way. Thank you to Robina McCurdy for supporting this campaign! Thank you to Alfred Decker for supporting this campaign! Alfred Decker is the founder of Permacultura Barcelona and the Forest Gardens project at Can Masdeu, is a member of the Permaculture Council of Europe and participated in the European Permaculture Teachers Partnership, and recently completed a postgraduate diploma in sustainable architecture and renewable energy (Centre for Alternative Technology, Wales). After taking a permaculture teachers training with Rosemary Morrow in 2011, he undertook a two year mentorship and later co-taught five courses with Rosemary, ultimately earning a diploma in Permaculture Education & Community Development in 2013 through her organization Blue Mountains Permaculture Institute in Australia. He also co-edited her forthcoming manual “Permaculture Teaching Matters” and organized a successful crowdfunding campaign to create a digital platform for her life’s work in teaching. Alfred has taught widely throughout Europe, and in 2014 left his beloved Barcelona in order to move to Mallorca and collaborate with PermaMed. It was Alfred who taught us about We the Trees as a crowd funding opportunity. Thanks Alfred! Thank you to the PermaMed team for your support! Permacultura Mediterránea (PermaMed) is a permaculture association dedicated to education and permaculture design with a focus on Mediterranean bio-regions. We need roughly 3600 dollars (approximately 3155 euros) to cover nine people for 14 days of food, lodging, course materials, and transport. Any extra money raised above the $3600 we need to meet these costs will be donated to the PDC scholarship fund and exchange program to help provide access for other youths, teachers and folks interested in participating in a PDC but who need help with financing. If we don't meet our $3600 goal we loose all the contributions - they go back to you. In appreciation of your contributions we will be offering the listed fun and interesting rewards. Please share our campaign with others and thank you for your support!